Peanut butter (or other nut butter) and banana. All you need to do it putting the peanut butter on the banana, take a bite and then repeat until banana is gone. Bon apetite. Ha, I think I’ll call it a recipe. That everyone can do. See, now you can call your mum and tell her you know how to cook (no, no, no need to call me and thank me personally, you are more than welcome). Now, if you are worried about eating banana for some reason (that you might put on five kilos after eating it mainly) you should read this. But what about peanut butter? Something so tasty can’t possibly be good for you, can it?? ‘Good for you’ is such an interesting term though. What does it mean? And what I mean is good for me, might not be what you think is good for you. Or what the doctor thinks is good for you (I usually disagree with my doctors advice). But, peanut butter? Not that bad is it? Put the nuts in a blender. 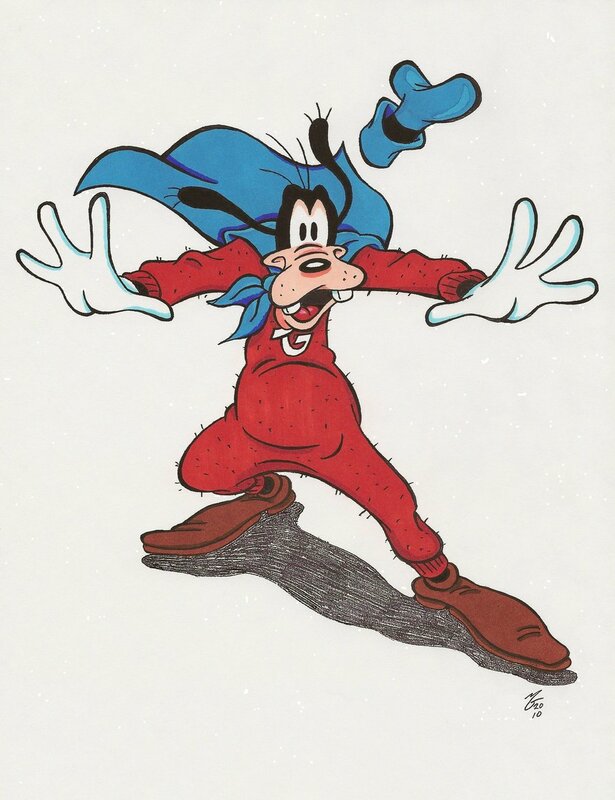 Whizz. 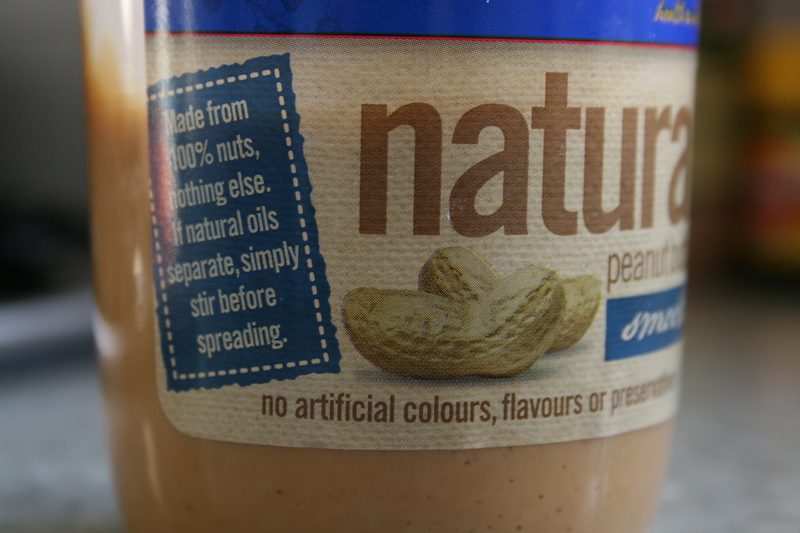 You might need to use a spoon or knife to scrape the nut-butter mix down from the sides ever now and then. Whizz until looks like butter. Simple. Should look along the lines of this. If you like it crunchy, then stop earlier or add some crunched peanuts afterwards. So easy and so tasty! 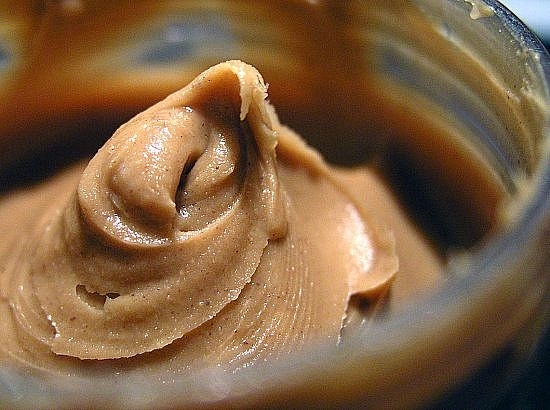 I can’t believe you have learnt how to make peanut butter from scratch and The Easiest Snack Ever all in the same day. Give yourself a pad on the back, well deserved. 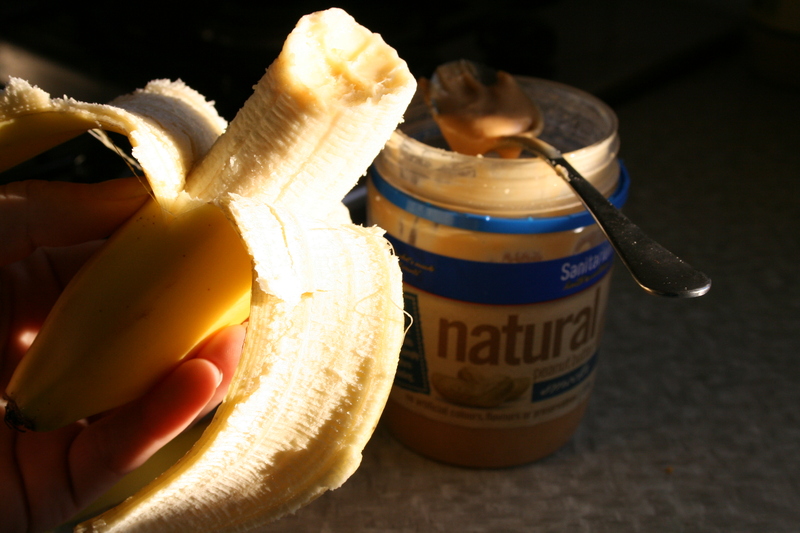 Now, who’s gonna have some Banana with Peanut Butter as an afternoon snack? This entry was posted in Interesting Things About Food (Mostly), Recipe and tagged Banana, Breakfast, Easiest Snack Ever, Food, Goofy, Healthy Lifestyle, Homemade Peanut Butter, Is Peanut Butter Good For You?, nut butter, One ingredient recipe, Peanut Butter, Peanut is a legume, Recipe, Snack, Super Goof, Two ingredient recipe. Bookmark the permalink. Mmm tasty, I also really want to try making ice cream from frozen bananas and adding peanut butter and cocoa. Have you tried this? No, but now I want to! And I’ve got the ingredients, but I’ve packed down my food processor 😦 Now what do I do?? Let me know when you’ve tried, sounds amazing! Sounds awesome! Will definitely try it!! Jen that is one of my favorite desserts! Awesome Ashild, freeze bananas (sans skin, and I like to cut them into 2 inch pieces before freezing). Put the pieces in your food processor and let it rip! Sometimes it needs a TINY bit of almond/soy milk to get going (like, 2 teaspoons. Too much will make it runny and change the texture) until it has the texture of fro yo. Then I put in a few tablespoons of PB, pulse once or twice, and have a delicious snack! Like Jen mentioned, sometimes I put in a tiny bit of cocoa, but I’ve found I prefer just the PB and will sometimes add some dark chocolate chips after I’ve removed the mixture from the food processor. Just don’t re-freeze the mixture! Ya gotta eat it after making! That sounds DELICIOUS! I’m sure it could work because I’ve eaten mashed frozen bananas. Adding the PB would probably smooth it out and add some yummy fats :). Perfect for a summer time snack! Comforting AND good for you at the same time 🙂 Win-win! My afternoon snack yesterday was a large banana with almond butter on it. Very yummy. Thanks for following me at http://homespunhappenings.wordpress.com/. I always eat peanut butter on my bananas. Is there any other way? I tried the ice cream Jen suggested. It was worth the try. Have a blessed day! I snack on PBB sandwiches often. And will forgo the bread on occasion. Because bread is starchy fat or something. I don’t know. I’m so happy there’s someone here in Australia that doesn’t have an aversion to peanut butter on “anything else other than toast.” I LOVE LOVE PB on Bananas. I’ve made the easy “ice cream” just blending the two together. How about “ants on a log”? PB on celery, topped with raisins. I like to melt 70% Dark Chocolate and mix with the all natural peanut butter and dip my bananas into it. It is filling and amazing treat! fills me up for hours. Thanks for following. Yeah, it is a meal in itself! I usually eat this when I know I won’t be able to eat for hours. It keeps me full longer than anything else. 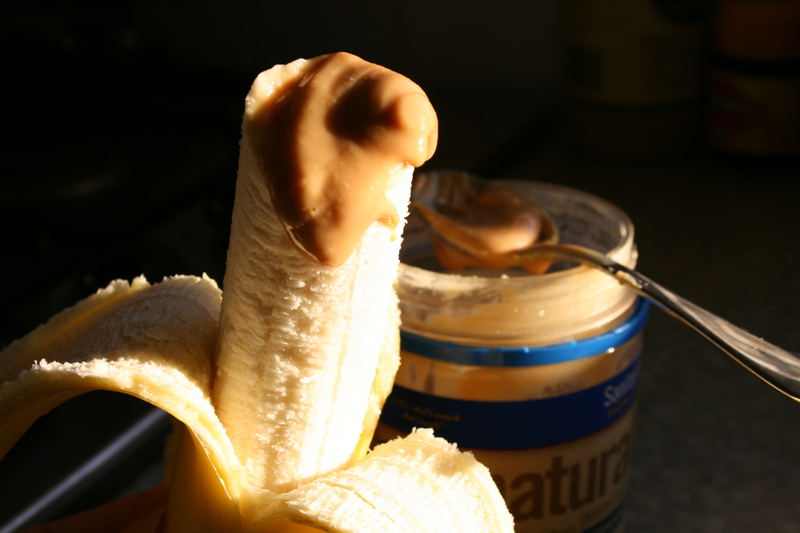 I love PB and banana. Have you ever tried PB and cheese though? Sounds odd but very good. I also love putting pb or another nut butter in my oatmeal instead of using syrup. Delish. This post really makes me want to pick up some bananas tomorrow! I’m so glad that someone in Australia likes peanut butter. All the counselors at my camp from there thought it was way too salty and when I lived in Spain had to have it mailed to me. Too bad I hadn’t read this prior I could have made my own!